Your organization must meet the time demands of your customers. Timely service matters. Response to questions, updates on issues, and solutions must be provided it an agreed amount of time. The agent must receive notification of possible breaches, to prevent ticket escalation. OTRS scales well with your needs and offers management of service level agreements (SLAs). OTRS provides you with the possibility to create numerous service level agreements covering all of your service and customer need. 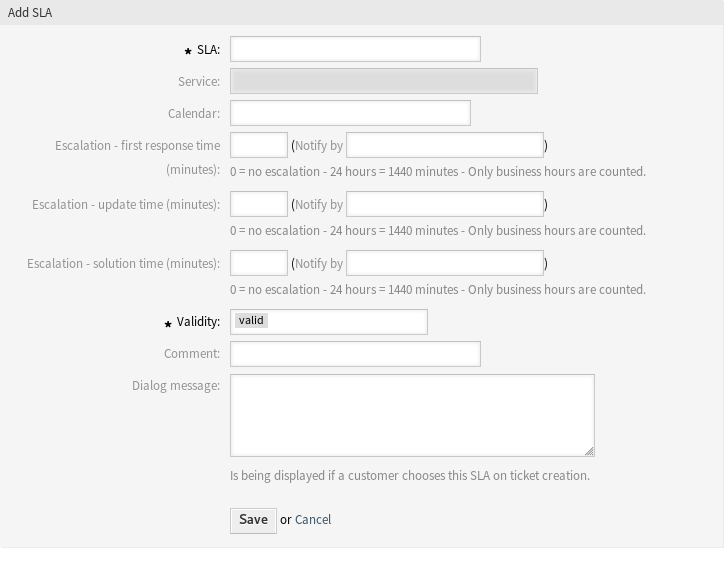 Each SLA can cover multiple services and define the availability of service and escalation periods. Use this screen to add service level agreements to the system. A fresh OTRS installation doesn’t contain any service level agreements by default. The service level agreement management screen is available in the Service Level Agreements module of the Ticket Settings group. Adding service level agreements requires, that at least one service is added to the system. Create services in the Services screen. Click on the Add SLA button in the left sidebar. Service level agreements can not be deleted from the system. They can only be deactivated by setting the Validity option to invalid or invalid-temporarily. Click on a service level agreement in the list of service level agreements. If several service level agreements are added to the system, use the filter box to find a particular service level agreement by just typing the name to filter. Select one or more of the Services to be assigned to this SLA. 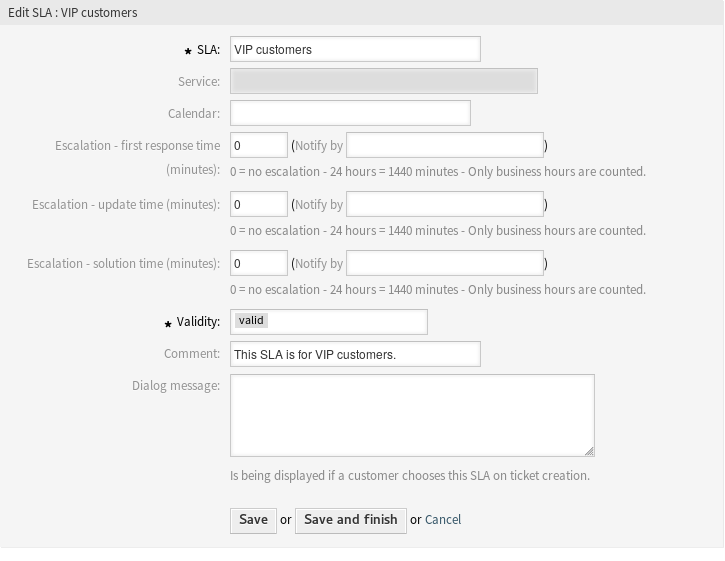 Is being displayed if a customer chooses this SLA on ticket creation (only in the external interface).